The leading company in PC market, Toshiba has announced its first mini-laptop from company named as NB205, which comes with 10.1-inch TruBrite screen LED-backlit and a full QWERTY keyboard. The LED-backlit is nominally greener than CCFL-backlit screens and helps the system last longer on a charge. 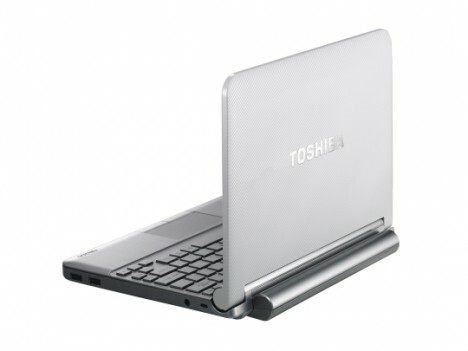 The new Toshiba NB205 netbooks will run on the Windows XP operating system and use the 1.66GHz Intel Atom N280 processor. In addition, the netbook is equipped with a built-in impact sensor which help to protect its hard drive.The new NB205 also comes with built-in USB ports with sleep-and-charge technology which lets users recharge peripherals even if the netbook has been turned off. Toshiba NB205 is available in two versions. The NB205-210 will cost $350 and come in black color and has a full flat keyboard, while the upgraded version of NB205-310 is equipped with Bluetooth capabilities, has a metallic finish, comes in four different colors (Sable Brown, Frost White, Posh Pink, or Royal Blue), and has an styled chiclet keyboard. The later costs $400. The new Toshiba NB205 netbook weighs only 1.31kg (with 6 cell battery) will be available via Toshiba website or leading retailers for starts price from $350.